which appear to show cloud like formations on Mars. The image was taken on March 22, 2012. 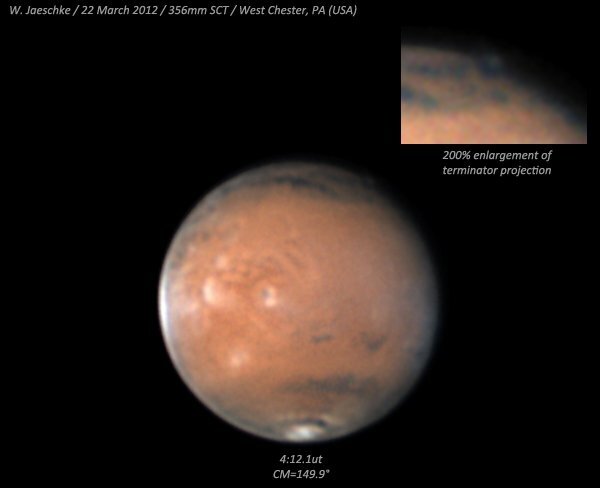 Wayne Jaeschke, from West Chester, Pennsylvania, first noticed the formations which can be seen rising up from the edge of the Martian disk after he took the pictures on March 20. Some observers have suggested the so-called clouds are at least 150 miles away from the surface while others have suggested it could be debris which was disturbed after the Red Planet was hit by a meteor. Accroding to Jonathon Hill, a member of the Mars Space Flight Facility at Arizona State University, to Cosmic Log it’s not completely unexpected. But it’s bigger than they would expect. Jonathon Hill and his team will be looking at the area of the formation using the Thermal Emission Imaging System or THEMIS. The Thermal Emission Imaging System (THEMIS) is a camera on board the 2001 Mars Odyssey orbiter. It images Mars in the visible and infrared parts of the electromagnetic spectrum in order to determine the thermal properties of the surface and to refine the distribution of minerals on the surface of Mars as determined by the Thermal Emission Spectrometer (TES). THEMIS will also check out heightened cloud activity around Mars’ shield volcanoes as well as around the southern site spotted by the amateurs. The formation has decreased in size over the past two days, but there is still time for both amateurs and professionals to pool their resources together and provide much needed information. This example is just another one of the importance of amateur astronomers and the impact they can make to help uncover mysteries and other events.